← Pirate Adrian Wins in Belgium! A great weekend of RB at the FAlmouth HQ has just concluded with four new county crowns being awarded. 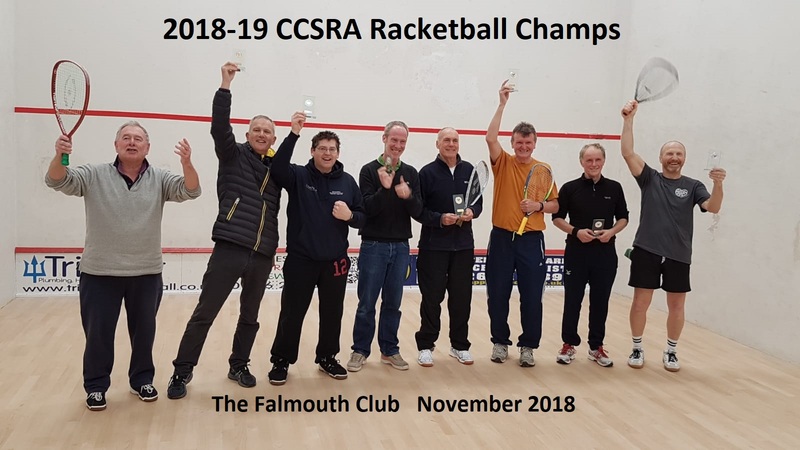 In the O70s it was an all-Falmouth affair with ‘youngster’ and county president Terry Becket taking the title against defending champion Mike Fernilough. Both players showed great agility and skill in front of an appreciative audience to showcase why RB has a lot to offer after the squash rackets have been hung up. In the 60s, favourite and reigning champ Tony Bowyer really had his work cut out against a determined and extremely mobile Nick Banfield. In the end the 3-1 scoreline reflected more the merits of steadier play and fewer unforced errors. In the 50s it was an all-Pirate affair with Chris Davel taking on Ian ‘The Dive’ Hatch. The rallies were long and hard and most in the gallery felt for Hatchy who only and hour or so before played our a grueling 3-2 in the semi against Dave Smith from Truro SRC (Match of the Tournament). Chris put Hatchy to the cutlass in a ruthless display of errorless RB. The 40s final was fast and furious with Truronians Pete Ellicock and James Green taking centre stage. James did extremely well and probably won the more exciting rallies but Pete, as a hardened RB practitioner, showed his true class at the age group – quite an exhibition! Thanks are extended to The Falmouth Club for generously hosting the event. The famous club is in good health at present with an active and forward thinking committee which is a delight to see again. 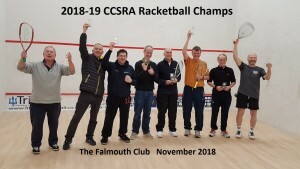 By far the biggest thanks go to Mark ‘Sir’ Newton whose return to these shores and The Falmouth Club is surely great news for everyone in the squash and RB community in Cornwall. A great event!